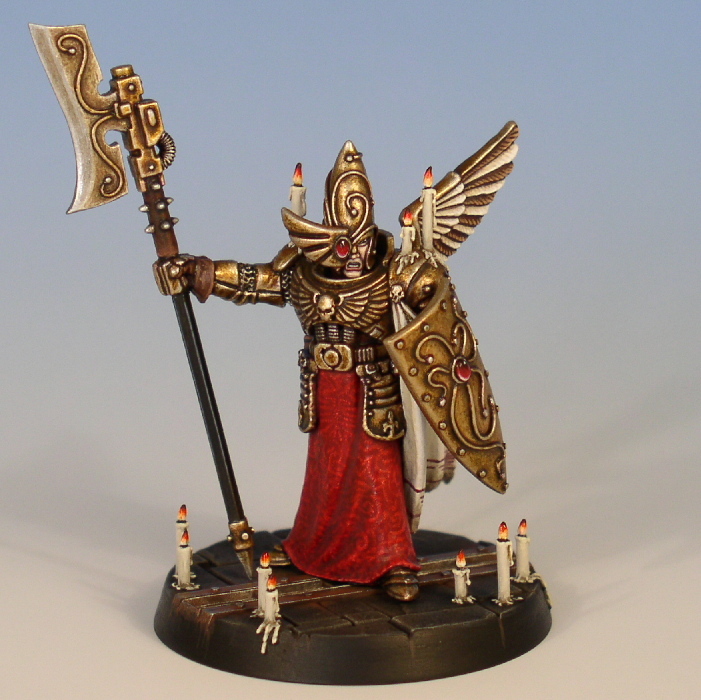 My Custode Guard has been on it's way since I started building him in August '03. I finished/revised the figure for GDUK 2005 by adding a bigger base and touching up most of the areas on the mini. The model relies heavily on my previous inquisitorial models (inquisitor w. servo skull, armoured inquisitor) - both when it comes to converting and painting. A bitz round up for the model goes as follows: Space Marine torso, holstered boltgun, and fuel container from a flamer; old Space Marine power axe for the halberd; empire knight's arms; empire plastic soldier's leg armour plates; feathered wing from Dark Angel commander Azrael's shadow creature; high elf silver helm head, decoration wing (on head), and armoured feet; 4th ed. high elf plain plastic shield; and a really old high elf cape. The rest is greenstuff and plastic card. On this model I have tried to be extremely sellective with my colour palette. Thus the model is really only gold, red, black, and white. To contrast the warm colours I have mixed green into a lot of the washes to add the compliment colour of the red in the creases and shadows so to speak. Another entry from GD UK 2005: Kroot Mercenaries.